Cities drive economic performance, and set the stage for our largest environmental and social concerns. It has been estimated that in 2016, 75% of GDP is accounted for by the world’s most economically powerful cities. When these cities begin changing, so to do our lifestyles and businesses. At present, these city changes are speeding up. The UN reports that 54% of the world’s population now live in cities, with this figure expected to rise to more than 66% by 2050. Trends in the economy and businesses also change our cities. New York City and London have both experienced a boom in their economy in the past 75 years due to the rise of their global finance industries. Every city in China have also benefited by the country’s expanding economy, and the same can be said throughout cities in East Asia. Dubai has similarly benefited through moving away from the oil industry and into services. An advance in technology is arguably the biggest influence of dramatic changes to our cities. So called ‘smart cities’ are the new way for economic growth, as they provide an insight into how cities will rise and change in the future. Singapore is an example of a city of the future. Urban planning has avoided many problems cities such as Sydney are currently facing, including sustainable development, efficient public transport systems, and housing. More than 80% of Singapore’s population live in government-built housing, and for citizens, the home ownership rate jumped from 59% in 1980 to 91% in 2015. Urban planning has allowed the city to remain green even despite the huge amount of infrastructure within the city. Although it is densely populated, Singapore is the most sustainable city in Asia and one of the greenest in the world. This is largely ensured through the expectation that developers must give back the same amount of green space their sites remove. Vertical gardens are an example of how this has been accomplished. Other cities throughout Asia such as Xiamen are following this example. 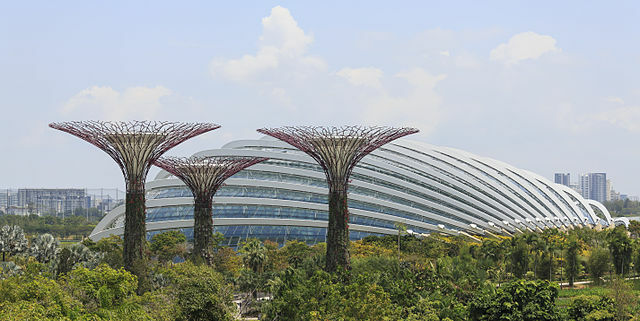 Singapore’s development laws allow the city to remain one of the greenest in the world. Two distinct trends have emerged in workforces in cities. Particularly noticeable in the Australian banking industry, office space per employee has been reduced as workspaces are designed around group activities. This allows flexible workspaces to be developed as it is assumed more employees will work from home, interstate, and other various locations. As well as this, co-working is another globally growing trend. Co-working is very popular among startups and small businesses as they are able to cut costs involved with renting office spaces. Instead, businesses are able to rent desks and meeting rooms as required. Co-working spaces have grown from 75 in 2007 to 8000 in 2015 around the world, according to research from CBRE. This growing demand for shared office spaces has caused disruption in real estate as more and more businesses are seeking flexibility, shorter leases, and fit-outs which enable collaborative work. In Singapore alone, the number of startups grew from 24,000 in 2005 to 42,000 in 2013. One of the more obvious ways cities are changing is the introduction of driverless vehicles. Self-driving cars are currently being trialed in cities throughout the world. In 2016, a huge US$847 million was invested in this technological breakthrough. In Perth, WA, the first self-driving bus was trialed in 2016, while a fleet of self-driving taxis are being tested in Singapore. These cars have the potential to reduce the rates of accidents on roads and increase mobility for those individuals who are unable to drive themselves. As well as this, driverless vehicles can encourage cheaper transport with driverless taxis, however, what will this mean for the thousands of jobs which will be lost? The full effects of self-driving vehicles are not yet known. Some experts predict that it will cause more traffic congestion and a greater strain on infrastructure unless ride-sharing truly takes off. As well as this, they eliminate government revenue from driving errors. One way that governments can combat this is through charging fees to drive on major roads in cities during peak hours. Singapore and London are both cities which are already doing so, allowing them to lower traffic congestion and the associated costs of lost time and emissions. Predicting what the future will hold isn’t easy. Given the infrastructure in cities, and their strong connections to national economies, this forecasting becomes even more difficult. However, with the evolving needs of businesses and consumers, and the breakthroughs in technology, it can be understood that cities will change dramatically in the oncoming years.